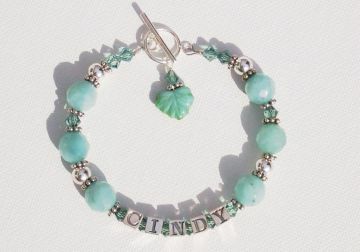 This easy personalized mother's bracelet is a favorite project! 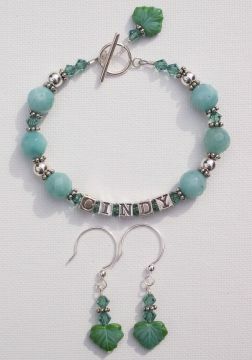 You can make personalized name mothers bracelet, a grandmother's bracelet, baby bracelet, or a friend bracelet. 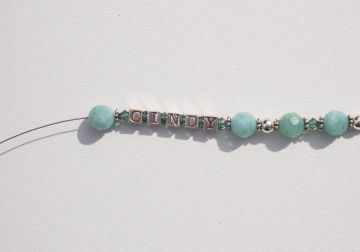 Use one or more strands of beading wire to create more than one name. Attach a favorite charm to the clasp. The possibilities are endless with your imagination and some good beads. 1 clasp of your choice. 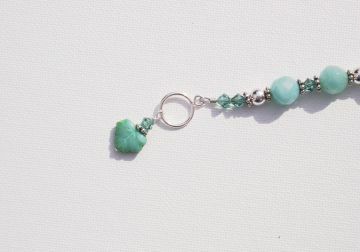 For this bracelet I used a sterling silver toggle clasp. Enough beads to complete the desired bracelet length. Because the length will vary depending on how many alphabet blocks are in your name, you may need to add or remove beads from the design. Here I used 6 Amazonite beads (12mm), 4 smooth silver round beads, 15 Bali beads (daisy spacers), and 13 Swarovski crystals (bicone). TIP - Lay out on a bead board or ruler to check your overall design and length using your own beads. Your choice of charm to attach to the toggle. 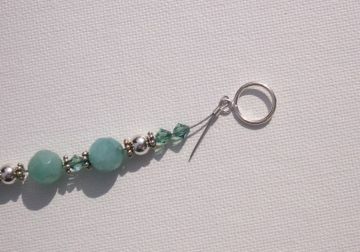 Here, I used a glass leaf bead which I simply attached to the round toggle part of the clasp. You can attach baby booties or other charms to make this bracelet unique and special. Repeat pattern in opposite direction after you have finished stringing Alphabet beads. 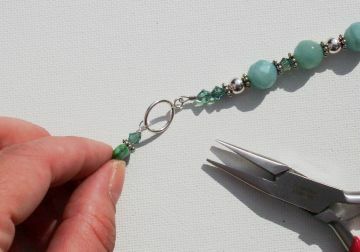 TIP - You can start a bracelet by attaching the clasp to one end first, However, if you are unclear about your final design or the finished bracelet length, it is best to simply tie a knot or place some tape over the end of the jewelry wire, string your beads, and once you are happy with the design and length, attach the clasps to the ends. This way, if you find you need to subtract or add beads you can just remove the tape or knot and work from either end without having to cut off your clasp and start the whole thing over! This is especially important when working with name bracelets because not all names are the same length. 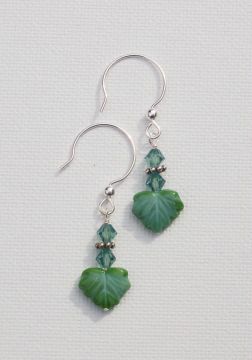 Next we will make a little dangle charm from the leaf bead. 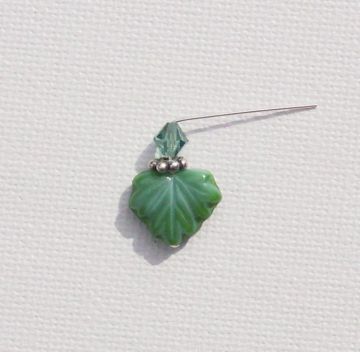 Slide a leaf bead (or your choice of decorative bead) onto a headpin, then add a Bali spacer bead, then a crystal. 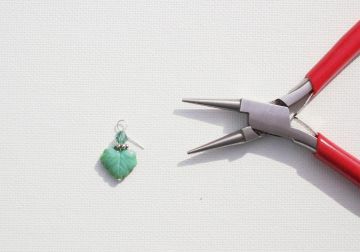 Use your round nose pliers to create a loop. Attach the loop to the round part of the toggle clasp so that it slides and hangs freely. That's it! Try these matching earrings for a complete set! Wouldn't this make a great gift for mother's day jewelry, or a birthday made with mom's birthstones? More Ideas: Use children's birthstone colored beads to further customize this bracelet design. 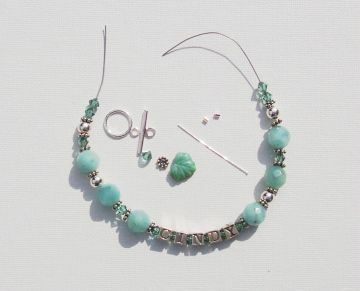 Instead of Amazonite beads for example, you could use Swarovski crystal beads in birthstone colors. See this color chart for more information.